Chief Executive Officers and Directors General of some of the largest Air Navigation Service Providers in Europe have today signed a Memorandum of Co-operation (MoC) to deliver the next generation European Air Traffic Management system. 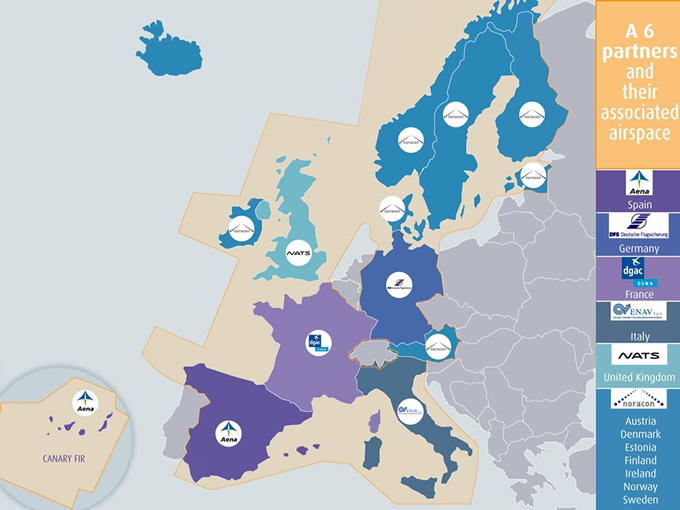 The MoC paves the way for increased collaboration between members of the A6 – Aena, DFS, DSNA, ENAV, NATS and NORACON A6 Group – a consortium of Northern European ANSPs – in the development and deployment phases of the SESAR programme. “This collaboration will provide the necessary drive and commitment to help change the shape of European aviation and deliver real benefits to our airline customers,” said Richard Deakin, NATS CEO. The MoC creates a formal structure for the A6 that will maximise the opportunity for the success of the ambitious SESAR programme. It will also allow the “A6 alliance” to optimise resources, share best practice, enhance common methods of operation and improve efficiencies. Key data : the A6 alliance represents 71% of ECAC airspace and controls 72% of the European air traffic (Source : Eurocontrol). NORACON A6 Group: Per Fröberg 00 46 1119 2635. The A6 is formed of the six ANSP members of the SESAR JU: Aena (Spain), DFS (Germany), DSNA (France), ENAV (Italy), NATS (UK) and NORACON A6 Group, a consortium including Austro Control (Austria), AVINOR (Norway), EANS (Estonia), Finavia (Finland), IAA (Ireland), LFV (Sweden) and Naviair (Denmark). The A6 was created in 2007 as an informal co-operation to present a consolidated view in negotiations within SESAR. Collectively these organisations control over 70% of the total air traffic in Europe and 80% of the Air Traffic Management (ATM) investment. The SESAR (Single European Sky ATM Research) programme is the technological and operational dimension of the Single European Sky initiative to define the European Air Navigation system able to meet future capacity and air safety needs. The development and validation phase of the SESAR programme is run by the SESAR Joint Undertaking. What is the role of the A6 versus CANSO? The role of CANSO (Civil Air Navigation Services Organisation) is to voice the interests of European ANSPs in the development of aviation and transport legislation and to ensure the ANSPs’ position is represented in all the relevant ATM institutional framework changes. CANSO has an observer role in SESAR JU Board, while the ANSPs of the A6 are full members. The role of A6 is to create synergies between the ANSP members of the SESAR JU to maximise customer and network benefits and to provide leadership at a European level in critical technical and strategic areas.